This post by the pretty famous aviation-centred geek Foxtrot Jalopnik takes a critical view of a graphic presented Contemporary Issues and Geography. 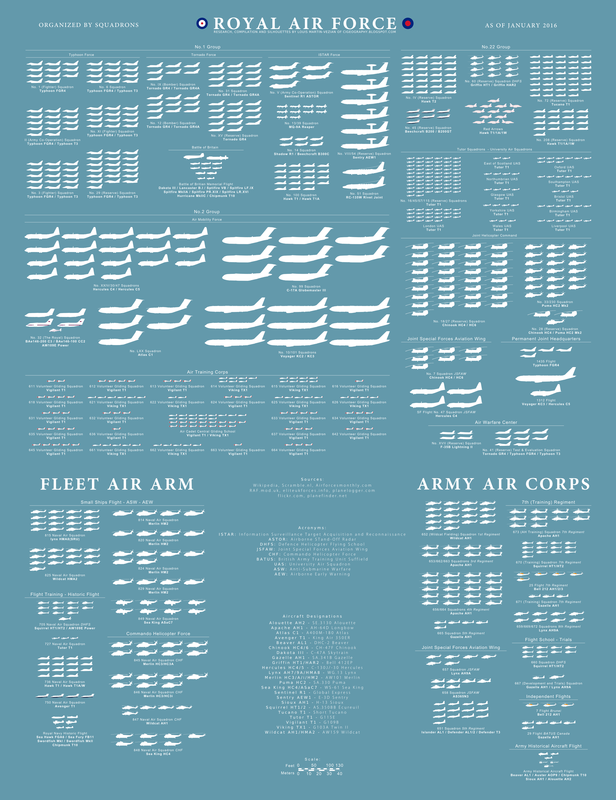 The picture as show below shows a graphic or rather ORBAT of almost all or all the UK’s active military aircraft, combat, combat air support and even training. This graphic will dramatically change once again in the coming decade as the F-35 is introduced into the Fleet Air Arm and RAF inventory, as well as other aircraft such as the P-8 Poseidon. Still, its unlikely that the UK’s air combat end-strength will ever look anything like it once did as recently as 2003 invasion of Iraq. Then again, the same can be said for America’s air combat aircraft inventory. If FJ’s post could be said to be critical, the commentators below are far more acerbic. Sxay91 bring up the common swipe that previous (Labour) governments have destroyed the UK military. Buzz Killington is even more biased, using the “usual” line hat the UK (and European nations) have to spend more on welfare (than the Us, which by the way, has some sort of welfare system in certain areas) and now has to tend to (Muslim) refugees. JohnDiz cites his (possible) own experience saying that UK Special Forces needed UK rotary and aviation support (damn the Special Relationship? ), FSBCyberPropagandaDivision calls the UK’s future carriers “useless” (not exactly about UK aviation) the list goes on and on. To sum up, These commentators who I guess are mostly American or Brits who want to jump on the bangwagon, agree the UK military aviation is shrinking, lousy, useless (insert your own negative adjective here). Ok, fine, it is a small force. It’s smaller than it was during World War Two (where by the UK did get US help through the Lend-Lease Act and the wider Commonwealth), it’s a smaller force since immediate post-World War Two, it’s a small aerial force since the Falklands, Gulf War One, Operation Telic. But ok, since FJ brings up the 2003 invasion. Back then, the UK just did have the Tornado Gr4 and the classic Harrier, but it did not have the high accurate Brimstone missile. It ha only the Tornado ADV, the air defence fighter which was definitely less agile and deadly as the Eurofighter Typhoon or its USAF counterparts. In 2003, the Nimrod was was certainly in the ORBAT and in more than one squadron, but not that it was really need for anti-submarine warfare (ASW). The Harrier version in Op Telic was the GR7, not the GR9. There was at best one Army Air Corps (AAC) Regiment there, but not the famous Apache. The UK used its old Lynx AH7 and Gazelle AH1s in the initially campaign. As for Royal Navy Fleet Air Arm (FAA) assets, Op Tellic saw the ageing Sea King, not the Merlin helicopter. The bottom line is, in 2003 Iraq War (or previous campaigns), the UK did have a numerically larger force of aviation assets and a larger variety. What it did not have back with those numerical quantity was quality. Today, even with a smaller FAA, AAC, and Royal Air Force, it has far better equipment and weaponry. The UK has Apaches (and soon to be upgraded AH-64s), Merlin HM2 and later HM4s, Lynx Wildcats, Eurofighter Tranche 1/2 and later versions, as well as other support and ISTAR aircraft. One most common touted weapon by politicians and the media is the Brimstone missile, used in Op Ellamy and the present Syria/Iraq campaign, Op Shader. Everyone wishes for a larger force and FJ did mention that the US aviation force is smaller than it was in Gulf War One and Two. Power doesn’t just come through quantity alone. Ok fine, quantity does matter, but as I’ve quickly shown, it matters at best with high quality. It’s a good ideal world to have large quantities of forces, aerial, maritime or land-based. But that’s an ideal world. For now, a good quality force helps more than just a larger quantity. Most people have fallen in love with long serving UK military aircraft like the Harrier, the Spitfire and perhaps the Sea King Helicopter. The Sea King Mk4 (the troop carrying version) will soon leaving active service and will be replaced by the Merlin HC.3/HC.4. Under the Future Force 2020 (not really SDSR 2010), 25 RAF Merlin HC.3s would be modified and transferred to the Royal Navy’s Fleet Air Army (also see this). Or more specifically, the Commando Helicopter Force (CHF) of, or rather for the Royal Marines. The plan has sort of proceeded smoother than most other post SDSR 2010 projects, with 846 NAS being the first squadron to gain these aircraft and then next, 845 NAS. In fact, 846 NAS just returned to RNAS Yeovilton (HMS Heron) with six/6 of these new helicopters. I believe, as the Defense Industry Daily article says, that there were to be at least seven/7, so maybe one more will join it (more on this below). At around the same time, the UK MOD announced a sustainment contract for both Merlin Helicopters. Some may say this is typical Conservative/Tory PR for their General Election 2015/GE2015 campaign, but you still do need investment to create and sustain helicopters. …845 NAS and 846 NAS each operating 10 Merlin HC.4s, with five aircraft in the maintenance fleet. Each squadron will operate three flights. 845 NAS will have three deployable, go-anywhere flights, with each flight deploying with four Merlins. 846 NAS will have the Operational Conversion Flight, Maritime Counter Terrorist Flight, and a deployable flight to bolster 845 NAS if required. Now that immediately seems strange. 10 aircraft per each active medium-lift squadron, but you want 4 x Merlins per flight? That would mean 12 x Merlins per Squadron. I guess the extra 2-4 will be drawn from the five/5 helicopters in maintenance? Or would this four/4 per flight configuration only occur during active operations/wartime? Pro-military people would of course still argue this 20 + 5 configuration is too small. I say it’s not bad consideration the fleet size is smaller than it’s counterpart, where 30 HM2 or Mk2 have been ordered and possibly eight more may be converted. Possibly. Now, let’s go even deeper into the helicopter itself. As said above, it is replacing the veteran Sea King helicopter Mk4. The Sea King supposedly is able to carry 28 troops while these Merlins will only carry carry 24 equipped troops. (I’m not so sure the Sea King’s were able to carry that many soldiers. The Agusta-Westland site says the Merlin can carry up to 38 troops but that’s only possibly without gear). There’s a good description on the upgrades of the Merlin HC.3/HC./3A to the Merlin HC.4 in this Naval Technology article. It is pretty well-written so I shan’t summarise it here. Overall, the Merlin HC.4 plan seems pretty alright, except how the FAA will detail the number of aircraft per flight. The maximum of twelve/12 Merlins for 845 NAS (as you see 846 NAS ultimately is for training and counter-terrorism, with only one flight for troop transport), means the CHF alone can only life a small almost company-sized force from ship to shore or from land to land. This is the stark reality of Future Force 2020. This post will be updated later.